Math is hard! Students struggle at home to remember how it was taught, and parents can grow frustrated because it's not the same way they were taught. These Google Slides give students and parents the step by step process of how to solve these difficult problems just like they were taught in class. ... Do you teach the concept slightly differently than I do? Problem solved! 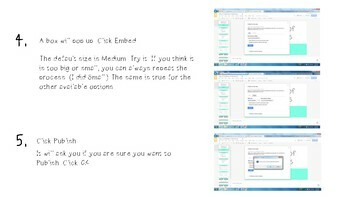 One click of the mouse will give you easy access to edit the slides as needed for your students! This product is a PDF that includes a link to Google Slides, similar to a PowerPoint, that teaches Lines. 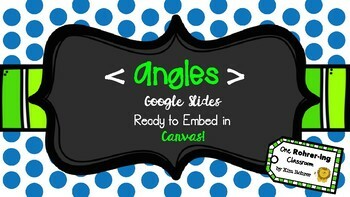 Students see examples and are given practice on the different types of angles and naming angles.The PDF includes instructions with pictures explaining how to embed your Slides in Canvas. You will need a free Google account and be able to open a PDF. There are three different ways you can use this product. 1. Use the Google Slides as a normal PowerPoint. 2. 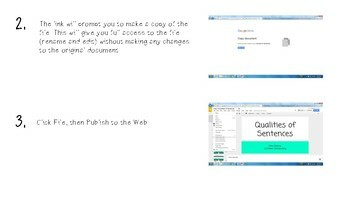 Follow the directions in the PDF to embed the Slides in your Canvas account. This will allow parents and students to view the Slides for review and homework help! Once the Slides are embedded in Canvas, any updates you make to the Slides will appear automatically in Canvas!